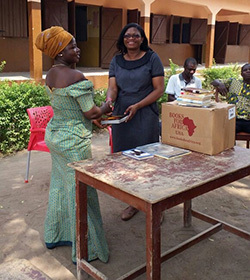 University of Wyoming doctoral student Adeline Borti initiated the “Access to Books Project” in 2016, with the hope of providing opportunities for struggling students to improve their reading abilities in her native Ghana. The project provides books and other literacy resources to encourage reading for pleasure and academic purposes in places where books are scarce. The project’s goal is to increase literacy in communities and schools in Ghana, Borti says. “One of the pillars of literacy achievement is the provision of a literacy-rich environment, and this is what the Access to Books Project is doing,” she says. The project also will facilitate the training of teachers and community volunteers to effectively use the books with children and to manage the libraries where the books are housed. Borti started collecting books two years ago that were donated to elementary school students at the Agotime-Wodome Salvation Army Basic School. The school is located in the region in Ghana where Borti grew up. She had previously visited the school several times with the hope that she could one day make a difference in the lives of local students. The project involved multiple facets, including securing the initial donation of books, soliciting funding to ship the books to Ghana, supervising book delivery, training the teachers and volunteers in the use and management of the book collections and, in some cases, renovating rooms in schools to serve as libraries. Victoria Gillis, UW’s recently retired Wyoming Excellence Endowed Chair in Literacy Education, worked with Borti to explore sources for funding the transportation of the books to Ghana. “Borti’s commitment to the children and teachers of Ghana, coupled with her leadership abilities, have made this dream a reality,” Gillis says. Borti selected 104 English language books to donate to the school. Most were storybooks for elementary students. The books help students develop an interest in reading for pleasure and help promote reading for academic purposes as they progress in school, Borti adds. Her professor and co-adviser Cynthia Brock, the current Wyoming Excellence Endowed Chair in Literacy Education, saw great value in the project. She provided funding for part of Borti’s airfare to travel to Ghana to deliver the books in person and present a literacy workshop for instructors at the school to help them become more effective literacy educators. The literacy workshop was attended by 18 of the school’s teachers. The content included current research findings related to reading/literacy, nurturing engaged readers/learners, maintaining the growth mindset as teachers and being reflective practitioners. Discussions during the workshop focused on teachers’ understanding of and appreciation of literacy and the importance of motivating students to improve literacy and academic achievement in the school. Further discussions suggested the need for literacy education resources for the teachers to continue to improve their knowledge about effective literacy teaching and learning. When Borti returned to UW, she applied for the Donne and Sue Fisher Doctoral Student Mini Grant in Literacy, coordinated by Dana Robertson, assistant professor and executive director of the UW College of Education Literacy Research Center and Clinic. The grant provided $750 to purchase shelves and additional books for the Agotime-Wodome Salvation Army Basic School. The need for educational resources for the teachers at the school was discovered during Borti’s 2016 trip. Grant money was used to purchase 21 literacy resource books to aid the instructors in their efforts to improve reading at the school. In addition to the resource books, Beitel Elementary School in Laramie donated 540 books to the program. The shelves and additional books were delivered to Ghana last fall. “I believe, through this project, many children in this school will have access to age- and grade-appropriate reading books to read and improve their literacy and academic achievement,” Borti says. With the school’s growing collection of books, she hopes to help the school build a library to store and protect these valuable resources. She also has written a grant proposal to the International Literacy Association to fund a four-day professional development workshop in literacy for the teachers at the Agotime District. Borti’s ultimate goal is to grow the project, and she has ambitions to expand to 10 additional schools in the future.